HAVANA (AP) — It was a little before 10 p.m. that February night in 1898 when a fiery explosion roiled the normally calm waters of Havana Harbor, blowing out windows in the city and sinking the USS Maine to the bottom of the bay, just the mast and some twisted metal wreckage left to poke above the waves. Havana's monument to the 266 U.S. sailors who died that night was dedicated 27 years later as a tribute to lasting Cuban-American friendship, a thank-you for Washington's help in shedding the yoke of Spanish colonial rule, which was known for its cruelty. 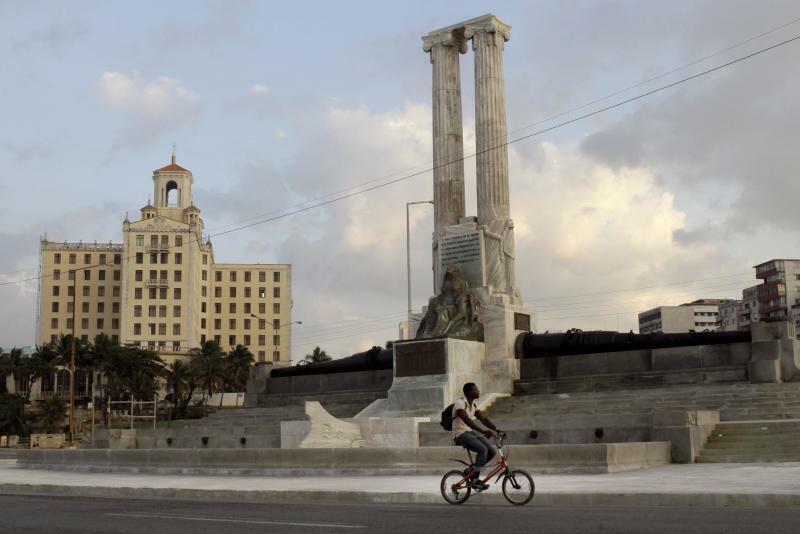 The years since have been unkind to the twin-columned monument, and to U.S.-Cuba ties. But while relations between Washington and Havana remain in deep freeze, the monument, at least, is now getting a facelift. The restoration project is fraught with symbolism, with the monument's scars telling the story of more than a century of shifts in the complex relationship and changing interpretations of the marble structure. "Of the monuments in Havana, that's one that really is struggling to contain all of these different historical episodes," said Timothy Hyde, a historian of Cuban architecture at Harvard University's Graduate School of Design. "It doesn't just symbolize any longer this single moment of the sinking of the Maine. It symbolizes all these periodic moments of antipathy and hostility and challenges between the two nation-states." Soon after the USS Maine suddenly sank off the coast of this Caribbean capital 115 years ago Friday, the United States accused Spanish colonial authorities of responsibility in the blast. "Remember the Maine!" became a rallying cry in the States, and after the U.S. victory in the brief Spanish-American war, Spain ceded control over Cuba, Puerto Rico, the Philippines and Guam. The Maine monument was inaugurated in 1925 and bears the names of all 266 sailors. Two statues standing shoulder-to-shoulder at the base represent a maternal America guiding the maiden Cuba into independence. Words etched into the marble quote an 1898 U.S. congressional resolution recognizing a free Cuba, and the massive bronze eagle that long capped the monument faced due north to symbolize Washington's promise to return home after helping the island break from Spain. "To me it signifies a legacy of loyalty ... friendship between two peoples," said Julio Dominguez Santos, the monument's night watchman for 17 years. But things didn't work out as that earlier Congress had hoped. Many Cubans resented the 1901 Platt Amendment, which said Washington retained the right to intervene militarily as a condition of ending the postwar U.S. occupation. The U.S. did in fact intervene several times, and American business and mafia gangs came to dominate many aspects of the island in the run-up to the 1959 revolution — leading many Cubans to feel like the eagle had never flown back north. Soon after Fidel Castro's rebels marched victoriously into Havana, the tense marriage rapidly careened toward divorce and diplomatic ties were severed in 1961. Following the doomed, U.S.-backed Bay of Pigs invasion months later, the more than 3-ton eagle was ripped from the monument during an anti-American protest and splintered into pieces. "The eagle was torn down after the triumph of the revolution because it's the symbol of imperialism, the United States, and the revolution ended all that," said Ernesto Moreno, a 77-year-old Havana resident who remembers waking up one day to see the statue gone. "I found it to be a very good thing, and I think most Cubans agreed at the time." Castro's government added a new inscription to the base of the broken monument alleging the Maine victims had been "sacrificed by imperialist greed in its zeal to seize the island of Cuba," a reference to speculation that the U.S. deliberately blew up the Maine to justify a war against Spain. Historians say the explosion was probably an accidental ignition of the Maine's own munitions, but the conspiracy theory still commonly circulates in Cuba. The Communist Party newspaper Granma, for example, has written in the past that the Maine victims were "immolated to serve as a pretext for American intervention that in 1898 prevented the island from gaining true independence" — ignoring the fact that Cuban rebels had failed to oust the Spanish on their own for decades. A Granma article published on Friday's anniversary was less certain, but still said American self-sabotage "cannot be ruled out, given the interest among the more aggressive imperialist circles in instigating war." The Maine eagle's head was mysteriously delivered to Swiss diplomats, who had agreed to act as protectors of U.S. property in Cuba. Today it hangs in a conference room at the U.S. Interests Section, which Washington maintains in Havana instead of an embassy. 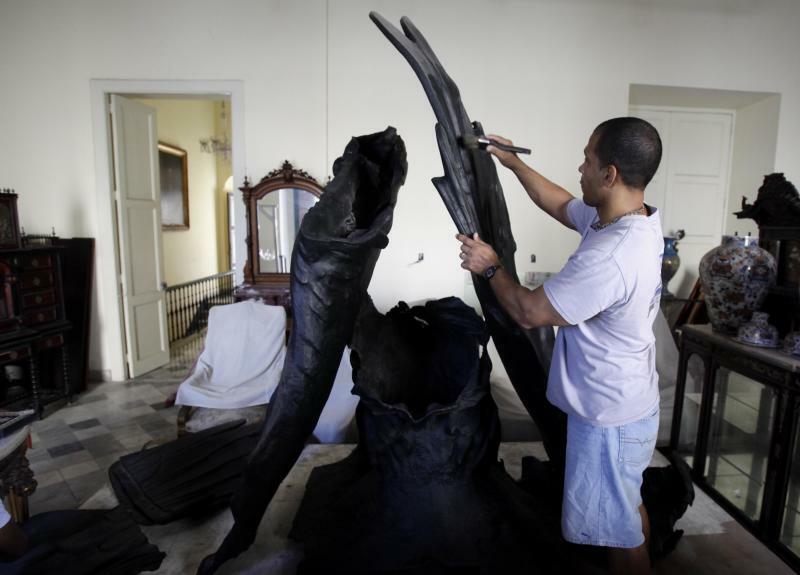 After relations were partially re-established in 1977, longtime foreign service officer Wayne Smith, who had been in Havana in 1961, returned and arranged to see the body, wings and tail, which are currently out of sight in a musty storage room of the Havana City History Museum. "I have been the faithful custodian of the body," City Historian Eusebio Leal, told The Associated Press. "Smith told me that until the body and the head are reunited, there won't be good relations between Cuba and the United States." U.S. diplomats also possess the monument's original eagle, toppled by a hurricane in 1926. Since 1954 that earlier bird has presided over the immaculate gardens of the Interests Section chief's official residence. A plaque at the base calls the eagle "a symbol of the enduring friendship" between Cuba and the U.S.
"I'm just happy we have it. I don't know how it got here. Somebody got ahold of it, saw it and gave it to us," said John Caulfield, the Interests Section chief since 2011. Coincidentally, the U.S. State Department recently sent two specialists down to repair the first eagle, which was cracked and tarnished green. 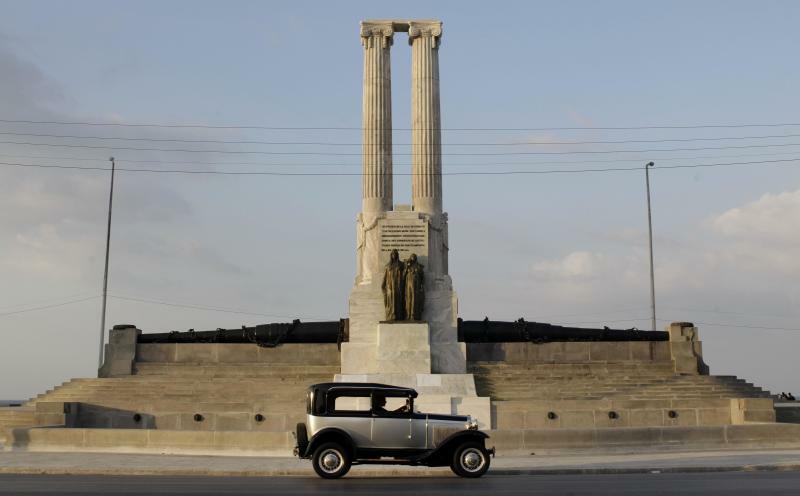 Like many structures in Havana, the monument on the seafront Malecon boulevard had become seedy from decades of neglect. Marble lion heads were damaged or looted, and the fountains were used as trash receptacles by passers-by. The repair seems to be part of a general restoration of hundreds of historic structures by Leal's office, unrelated to any change in U.S.-Cuban ties. Workers in blue jumpers recently removed scaffolding that shrouded the columns for months, revealing gleaming-white marble scrubbed clean of grime. Gone are the rusty stains beneath the two 10-inch guns that were salvaged from the Maine. The statues are a lustrous bronze again after corrosive salt air turned them bright green. Leal said his office intends to finish remaining tasks such as getting the fountains working and re-landscaping two adjacent plazas in the coming months. But amid the ongoing renovation, a return to the monument's original spirit of friendship seems unlikely — at least for now. "Certainly we have as much wish for that to be true today as we did at the time," Caulfield said of the congressional resolution inscribed on the monument supporting Cuba's right to be free. "I hope that we and the Cubans will see a new relationship with the United States that allows those words to be true." Leal said he also hopes for warmer ties, but first Washington must end the 51-year economic embargo and abolish "anti-Cuban" laws. Can he envision a bronze eagle resuming its perch someday atop the monument? "On the occasion of a friendly visit by a U.S. president," Leal said. "I wish President Obama would be the one to do that." Associated Press writer Anne-Marie Garcia contributed to this report.